Chef Glen Hagger has designed a range of Paleo, Vegan and Gluten Free recipes using the GH Produce range of paleo granola, paleo bread mix and vegan chocolate cake cupcakes. Warm, Hearty Winter Soup With Fresh, Paleo, Focaccia Bread. 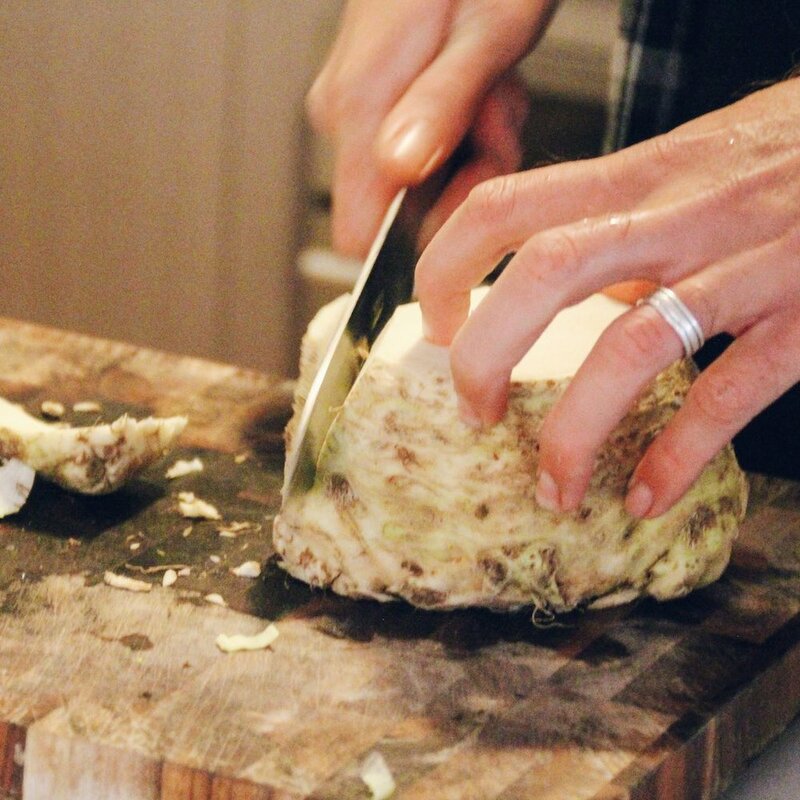 Celeriac is a vegetable often forgotten about because people are unsure how to use it. 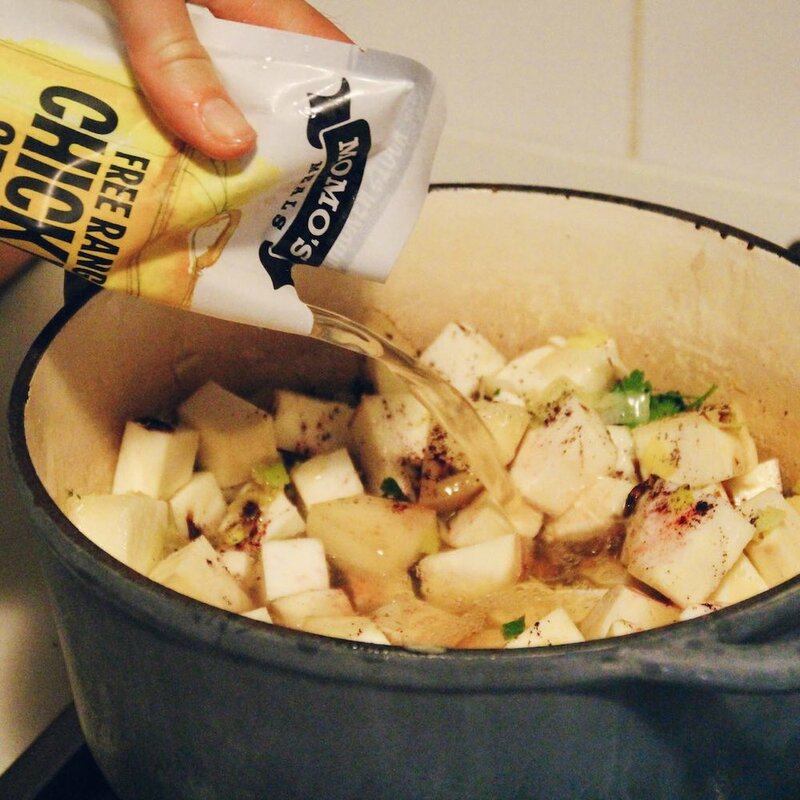 Can you believe that celeriac goes amazing well in soup! Especially combined with other root vegetables like sweet potato. 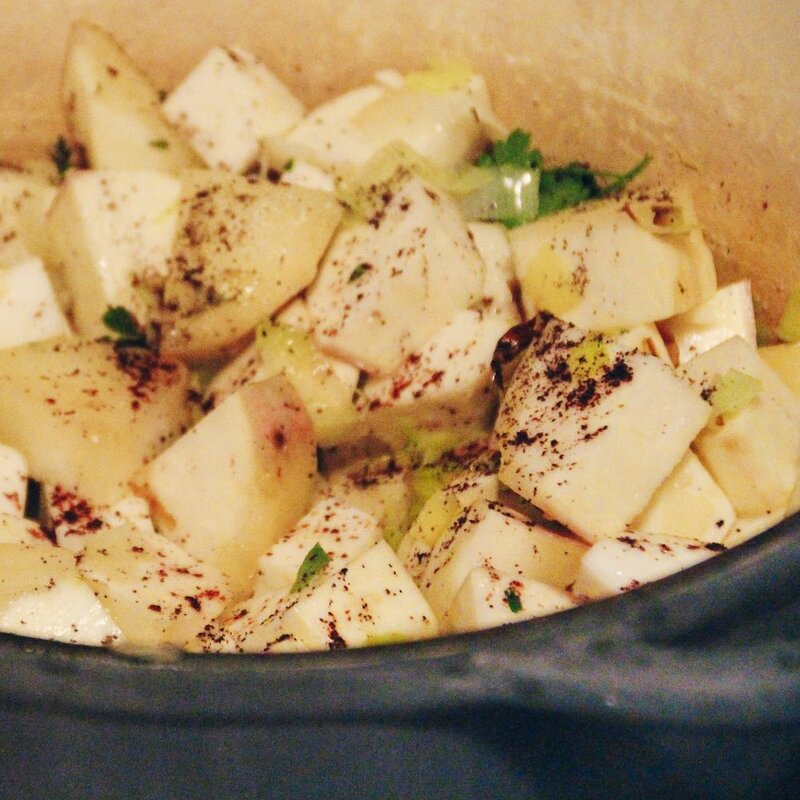 This one-pot-wonder is very simple to make and extremely flavoursome. It will warm you up in no time at all during the colder months and keep you full and satisfied. Make a big batch, keep it in the fridge, heat it up and you are ready to go. The vegetables used can be easily supplemented with other vegetables you have on hand (e.g. orange sweet potato instead of white) and you can adjust the ingredients according to your taste. But there is no soup without freshly sliced, warm bread on the side! Team this dish up with our GH Produce Paleo Focaccia and you really have yourself a winner. Heat a large pot over medium heat with a tbsp of olive oil. 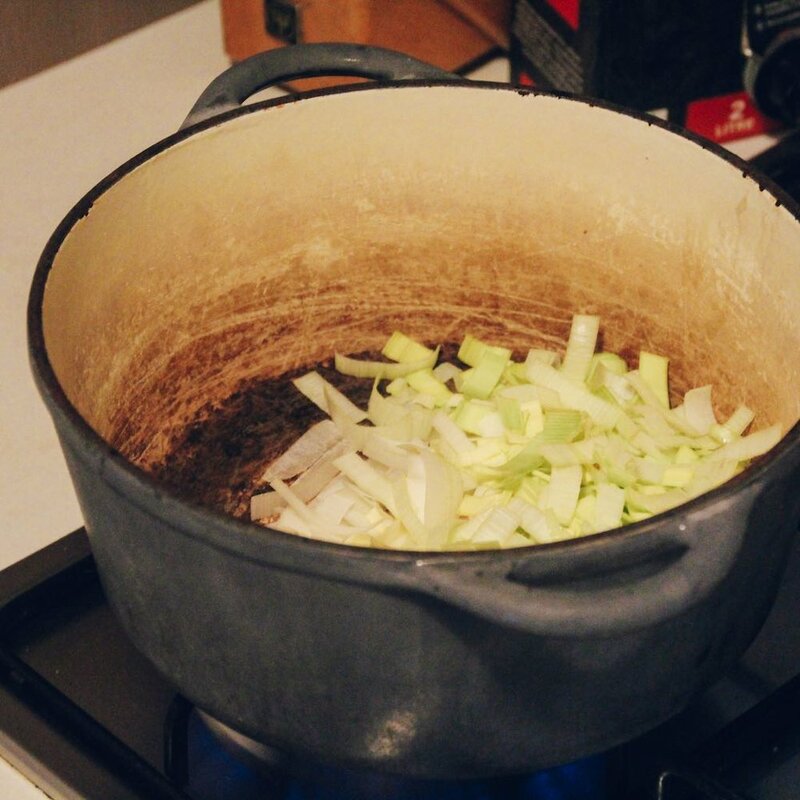 Roughly chop the leek and garlic, and add to the pot. Stir until soft, about 2-3 minutes. Peel and chop the sweet potato and celeriac into 2cm sized pieces, add to pot. Continue to stir for 2-3 minutes. Add herbs, spices, salt, pepper and lemon. Add the chicken stock, almond milk. If necessary, add water until the vegetables are covered. Bring to boil then simmer, uncovered, for 25-30 minutes until vegetables are just softened. 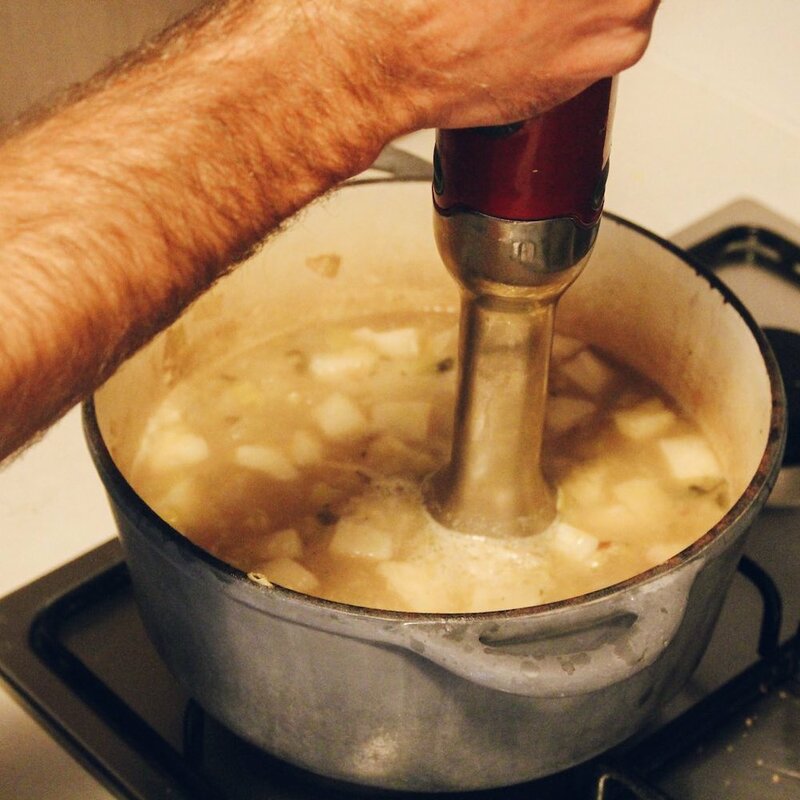 Using a stick blender, or blender, blend whilst slowly pouring in the olive oil as you go. Blend until smooth and creamy. Add more water if required to desired consistency. Store in an airtight container in the fridge for 5 days, or in the freezer for months. GH Produce is a range of paleo and gluten free products designed by Chef Glen Hagger to provide suitable options in grocery stores and cafes for people like myself with food allergies, or those just looking for a healthier and more ethical option when dining out. GH Produce supports local businesses, growers and where ever possible uses organic products.